Hills, vineyards, towering redwood groves and majestic oaks surround the town of Cotati. Downtown’s unique hexagonal square, La Plaza Park and its bandstand hosts a Kids’ Day Parade and Festival, a summertime farmers market, and the Cotati Jazz Festival. 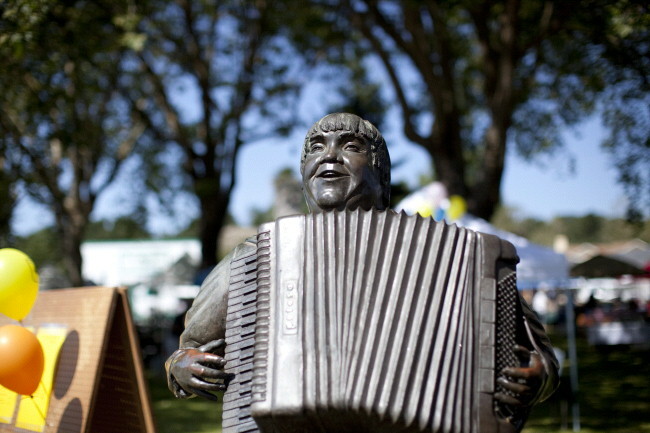 Cotati’s local flavor can perhaps best be experienced at the quirky Accordion Festival that attracts 2,500 aficionados of the squeeze box to La Plaza Park for a weekend of all things accordion. To maintain the small town feel, Cotati residents voted in the 1990’s to curtail the growth of the city by forbidding any annexation of land beyond a fixed urban boundary line. That ensures Cotati will remain a quiet, residential community with unique homes for sale. Housing in Cotati is eclectic and diverse. True to its progressive Northern California roots, Cotati is home to Frogsong, one of the countries first co-housing communities. Small vest-pocket parks abound, providing more than 45 acres of parks in this town of less than 10,000. The Cotati-Rohnert Park Unified School District comprises nine elementary (K-5) schools, two middle (6-8) and three high (9-12) schools. The main school is Rancho Cotate High School. Sonoma State University is close by, located just outside Cotati’s city limits. The students make for a lively weekend music scene in Cotati, with nightclubs and music venues that feature appearances by local bands as well as national headliners. For Cotati real estate market information, check out our Cotati real estate market conditions page.